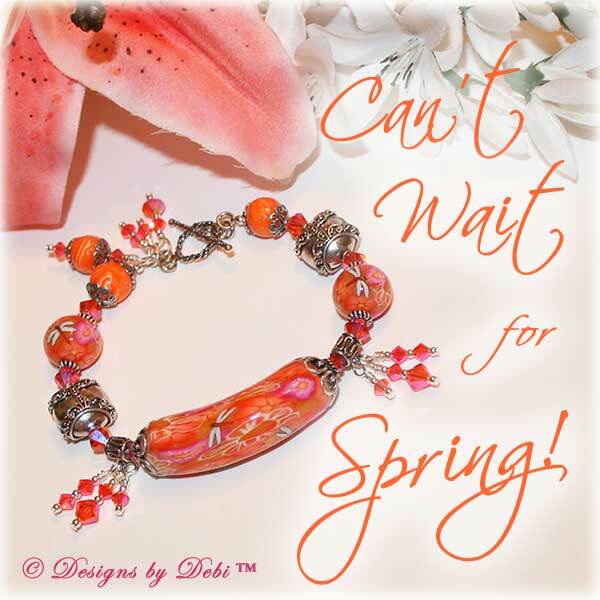 I began this bracelet with a set of three fun orange, pink and white polymer clay beads handmade by Bonnie Simonet. The set consists of a long, capped tube bead and two round ones all covered with flowers and dragonflies in gorgeous summer colors. 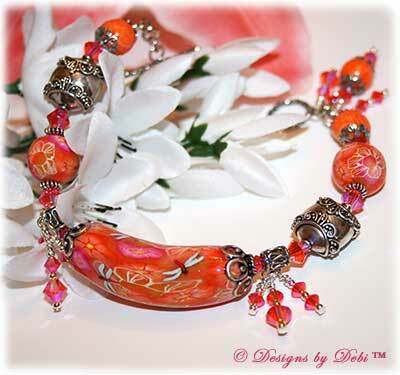 And I added 3 matching orange and white swirled polymer clay beads that I made. 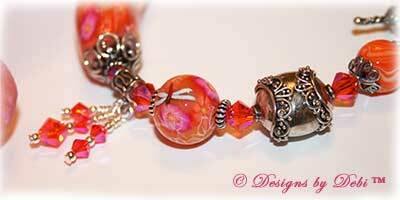 I accented these beads with Swarovski® red topaz AB2x bicone crystals. 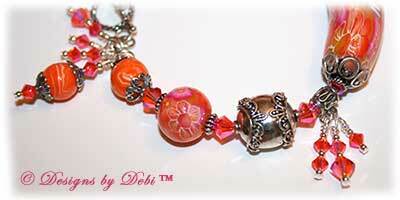 They match perfectly and even shimmer with pink accenting the pink flowers in the beads. I used them along the strand and in multiple dangle charms placed on either side of the focal tube bead and near the clasp. I just couldn't capture the effect of these in the photos, but believe me it's spectacular. I included some beautifully detailed Bali fine silver puffy pillow beads, Bali tube beads, sterling silver caps, rope beads and small round accent beads. 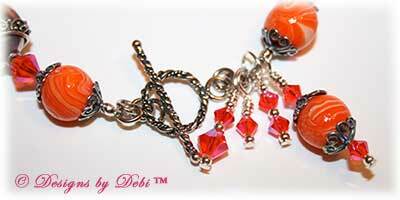 I finished the bracelet with a matching sterling silver twisted rope toggle clasp and 4 dangle charms hanging near it. The week of March 21-27 is a Week of Solidarity with People Struggling Against Racism and Discrimination and March 21st is the International Day for the Elimination of Racial Discrimination. 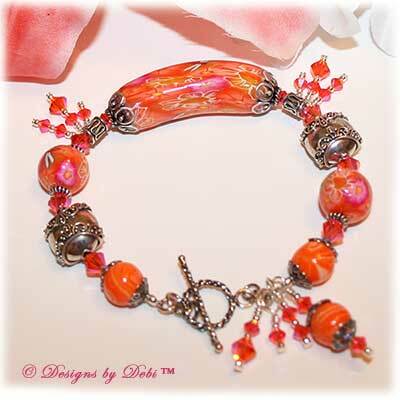 The ribbon color for Racial Tolerance is orange...the reason I chose an orange color scheme for the bracelet. If this is a cause that's meaningful to you, I can add the Awareness Ribbon charm to the bracelet at no charge. The charity I've chosen to receive the donation from this month's piece is The King Center. Established in 1968 by Coretta Scott King, it's the official, living memorial dedicated to the advancement of the legacy of Dr. Martin Luther King, Jr., leader of America’s greatest nonviolent movement for justice, equality and peace. The center is located in Atlanta’s Martin Luther King, Jr. National Historic Site and is visited by more than a million people from all over the world each year. Dr. King's great dream was for a Beloved Community for America and the world. The King Center uses a diverse array of media to educate people all around the world about Dr. King's life, work and philosophies in the hopes of one day seeing his dream fulfilled. Dr. King believed that the Beloved Community was a realistic goal, achievable by following methods of nonviolence. The core value of which was agape love, an unconditional love for all. I also hope we can one day achieve his dream, practice tolerance, appreciate each other's differences and live in peace. To find out more about The King Center or to make a donation on your own, go to www.TheKingCenter.org. 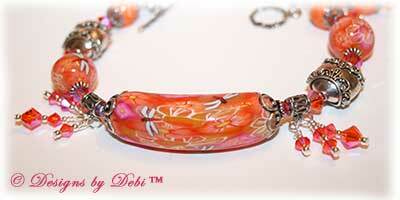 The bracelet as shown measures just over 9 inches and will fit a 7 to 7 1/2 inch wrist. I purposely left the additional rings on both parts of the clasp to be able to adjust it to fit a wider range of sizes without altering the design. If you need the bracelet re-sized, please let me know at time of purchase and this can be done prior to shipment at no additional charge.